The mysterious blood-tipped white lance that generally accompanied the Grail legend, was said to be the weapon that pierced the Fisher King (Jesus Christ's descendants in Grail lore) and ends his life. The lance, along with a cup, sword and dish (or platter), constituted the Hallows of Grail Castle. The Christian Gospel which accounts for this Jesus Blood Line comes from the apocryphal Acts of Pilate 15:7 which was omitted from the New Testament following Pope Gregory IX's first Catholic Inquisition of 1231 when Grail lore was condemned by the Church. It was not denounced outright as a heresy, but all material related to it was suppressed. As a result, the tradition moved towards underground symbolism, particular that of the Tarot cards (see Margaret Starbird). 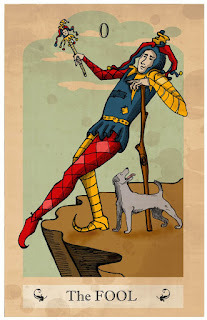 The four suits of the Tarot's Minor Arcana were the Swords, Cups, Pentacles and Batons (or Wands). These corresponded with the Sword, Cup, Platter and Lance of the Grail Hallows. 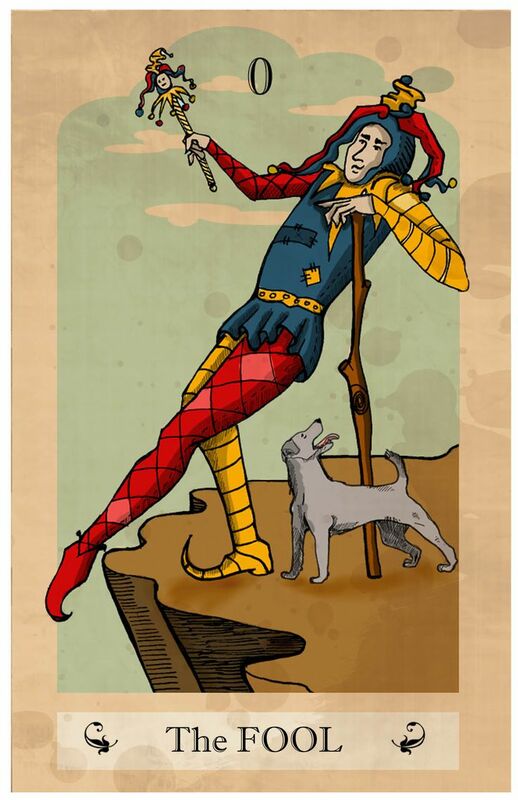 The secrets of the Tarot were held in the 22 trump cards -- the Major Arcana. The Tarot trumps have been called The Book of Thoth, an expression of the secret wisdom. The Church of Rome condemned the minor suits, but expressly banned the trumps because they were deemed blasphemous. In truth there was nothing anti-Christian about the playing cards, although they were undoubtedly anti-establishment. The Christianity of the Tarot was that of the old Grail lore, not that of Catholicism. The fact that gypsies and others subsequently used the Tarot cards for divination was quite incidental to their original purpose -- but it was through this secondary use that Church propaganda managed to foist an abiding sinister image onto the Tarot deck (Bloodline of the Holy Grail, pg. 207). The Joker is the simple man who succeeds where the more accomplished fail. Other Tarot figures have made their mark in the world at large. 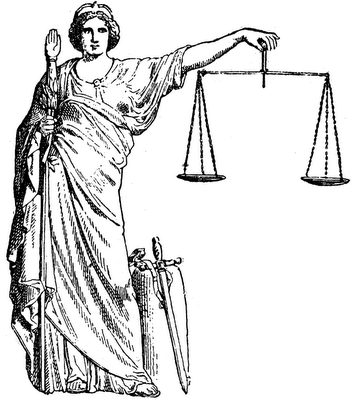 Not the least of these is the female symbol of Justice. 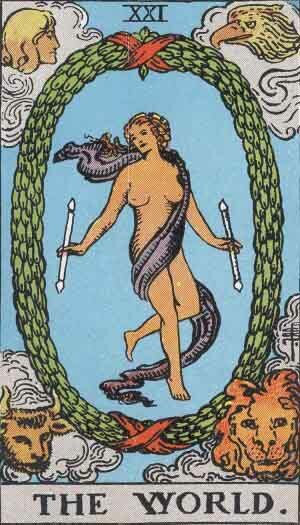 She is the star-maiden Virgo, with her two-edged sword and the scales of Libra. 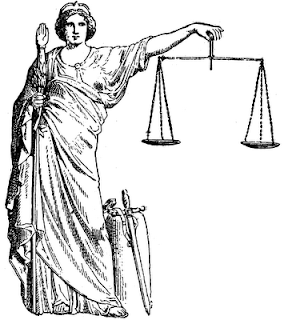 The portrayal actually has more to do with discrimination than with justice -- showing Nature's balance and harmony on the one hand, while the other wields the spike of judicial authority. the original card depicted the tenuous position of the Grail Church against the severity of the Roman Inquisition, and it was know as the Magdalene Card. Other cards associated with Mary Magdalene were The Tower, The World, and Strength. In the Grail tradition, The Tower represented the Magdal-eder (the Watchtower of the Flock, as in Micah 4:8), and it was not unlike a chess Castle (or Rook). Being struck by lightning, or otherwise mysteriously assaulted, The Tower symbolized the plight of the esoteric Church against the merciless Roman establishment. The spirit of Magdalene was also manifest in The World. Standing or dancing within an oval wreath, and either naked or clothed, the woman held a scepter or other mark of sovereignty. Some cards showed her above an encircled landscape. The portrayal was similar to the soaring, hair-enveloped Magdalene in the 1490 Sforza Book of Hours. 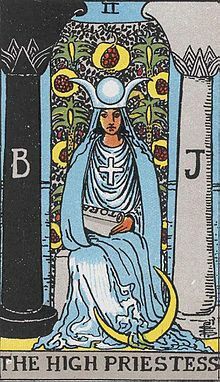 The Strength card normally depicted a woman in charge of a lion, or supporting a broken pillar. Some cards had both images. The former was the Lion of Judah, and the latter was the Pillar of Boaz from Solomon's Temple. Either way, the woman was the governess and mainstay of the royal succession.